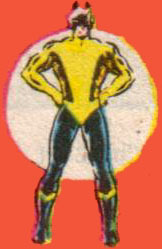 Aliases: Lectron; Master of the Atom; "the new sensational super hero of the seventies"
Powers/Abilities: Lectronn possesses "atomic-powered strength" to an unknown degree (class 10), the ability to fire potently destructive electron blasts from his hands, and flight by means of "lowering his own atomic weight". It's possible he has some degree of control over the molecules in his body to accomplish these feats. History: (Marvel Age I#49 (fb) - BTS) - At some point in the past, a member of an alien race from a distant galaxy began searching for worthy beings, so that he could offer them mighty power. (Marvel Age I#49 (fb) - BTS) - Early in his young life, Tommy Samuels was stricken with polio. He survived the experience, but lost the use of his legs and was confined to a wheelchair. (Marvel Age I#49 (fb) - BTS) - The alien arrived on Earth and began looking for worthy people. (Marvel Age I#49) - Tommy mused that he would have to spend the rest of his life in his wheelchair. Suddenly, the wandering alien appeared to Tommy, and pronounced him worthy of receiving his power. The alien then transformed Tommy into Lectronn, Master of the Atom! Being charged with the "mighty power" may have also healed his legs. Tommy thought it seemed like a dream come true! As Lectronn, he went to try out his powers, and came across a gang of thieves in the midst of a robbery. Using his new abilities, he easily overcame and captured the thieves. However, while they were in his custody, Lectronn's powers seriously injured the thieves. Distraught, the young hero learned that he must wield his abilities with great care - "for with great power, comes great responsibility". (Civil War: Battle Damage Report#1) - In California Lectronn rescued bystanders during an encounter between It the Living Colossus and the invading Stonians. 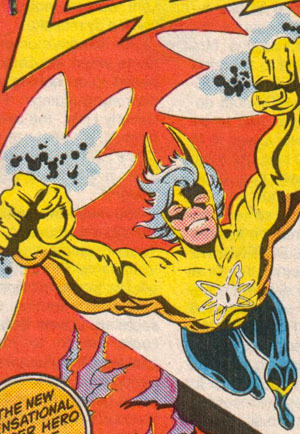 He eventually relocated to New York and almost attended Dollar Bill's "Defenders for a Day" event but instead helped Crimebuster and Janus the Golden Angel rescue bystanders from mystic debris of the cosmic crisis "Star Waaugh". Once he fought Schizoid Man to a standstill over New York for three hours. Lectronn retired after the Avengers and X-Men were defeated by the Masters of Evil and the Marauders. He married the entertainer Amy Jo Bessolo and moved with her to Pennsylvania. They had twin boys (Rider and Martin) and Tom adopted Nathan, his wife's son from an earlier relationship. Years later Tom and Amy Jo went to Ireland on a second honeymoon and Amy Jo became a victim of Vi-Locks, which were brought to Earth by Yandroth. Transformed into a Vi-Lock herself she left along with others Earth after Yandroth was defeated. It couldn't be prevent by Ireland's heroes the Kindsmen nor by Tom, who wasn't able to help at all. After that he re-trained his super heroic abilities and became active again to search for a way to rescue Amy Jo and prevent other potential crises. Lectronn came to New York to consult some local heroes. (Civil War: Front Line#5/4) - Along with Lightbright, Wildstreak and Phone Ranger he was arrested by Spider-Man and Iron Man. (Civil War#6) - Lectronn was freed from her cell in the Negative Zone prison 42 and joined Captain America's Anti-Registration heroes to oppose Iron Man's Pro-Registration heroes. (Civil War#7 - BTS/Amazing Spider-Man I#538) - Lectronn participated in the end fight between the anti- and pro-registration heroes in New York City. (Civil War: Battle Damage Report#1) - It is unknown if Lectronn survived the fight. According to The Marvel Age: 1974 Part I, an article in MA I#49, Lectronn premiered in Astonishing Tales#21, December, 1974. He was supposedly created by Jack Fury, "one of the greatest writer/artists of the 1940s". This was all a lie--or, rather, an April Fool's prank. MA I#49 was done up to look like a Christmas issue, and The Marvel Age article featured in it was entirely fabricated (though presented alongside a couple of extremely convincing fake covers). Astonishing Tales#21 was actually the first modern-day appearance of It, The Living Colossus. Lectronn's status as an Earth-616 character is a bit shakey. Though there's nothing in his backstory that runs counter to anything that we know of Earth-616, he hasn't appeared in a mainstream book--except in the dimension of Earth-1298 in Mutant X Annual 2001 & Mutant X#32. It's possible he's a native of the Mutant X dimension, but I prefer to consider that an appearance of a dimensional counterpart. Though "the new sensational super hero of the seventies!" was obviously hyperbole, I rather like the idea that Lectronn was active on Earth-616 during the 1970s, functioning as a hero of the pre-modern era... maybe he eventually became Electro-Man after realizing how dumb his name was? They both have a fleeting association with atomic power. That Tommy fell victim to polio is another reason I think he may be associated with the pre-modern era; the disease has been practically wiped out in civilized countries today, but the threat of it lingered into the 1960s in the United States. Assuming he contracted it in the late 1950s or early 1960s, he could easily have been a teenager or young man by 1974. I have no idea what race the wandering alien could belong to--that he's looking for "worthy people" to offer power has shades of DC's Green Lantern, and to a lesser extent Marvel's Nova Corps/Star Corps. Since the alien named him, maybe there's a Lectronn Corps? ... perish the thought. As far as I know, lowering your atomic weight wouldn't allow you to become light enough to fly, but rather change your place on the periodic table of elements--if he actually does that, his body should be turning into, say, molybdenum. Someone more knowledgeable in chemistry feel free to correct me. According to the made-up priceguide using a made-up copy of Overstreet in the issue, a mint copy of Astonishing Tales#22 (1st Lectronn) would have been worth $12 in 1987. Yes, the fake priceguide got the fake issue number wrong. Jean-Marc Lofficier: "Lectronn was likely an homage to French superhero Photonik. I think with that headpiece, and the fact that Photonik appeared in titles which reprinted Marvel comics in France, there's very little doubt. It might even explain why he didn't actually appear in a proper Marvel title." James Fry III: "I do recall seeing some foreign comics that were mostly Marvel reprints surrounding a little original, apparently European-produced material. It's very likely I saw him and unconsciously recycled part of his look." Lectronn attempted to attend the "Defenders for a Day" event, except that he got sidetracked, as mentioned in this profile. Marvel Age editor and all-around Good Guy Jim Salicrup wanted to do an April Fool's article in the mag, and needed folks to commit convincing but utterly fraudulent examples of '70s Marvel product. At the time, writer Sholly Fisch (What The--?s Milk and Cookies) was the regular writer on the feature that looked back at Marvel history, so naturally he would write the article. I was tapped to do the art likely because of my facility for mimicking styles and the fact that Sholly's and my senses of humor were (and are) pretty simpatico. The article chronicled a number of events that Simply Didn't Happpen, including an M.C. Escher-drawn issue of the Avengers, Daredevil's battle with a giant, cosmic-powered Foggy Nelson, and, of course, the first appearance of Lectronn. I drew the covers that went with the articles (and contributed the blurb for the DD cover: "My Friend--MY GOD!!!"). Inks were likely by the late Jack Abel (Lectronn) and/or G.I.Joe's Andy Myshynsky (Daredevil). The fake-Escher cover was never finished; Jim only had room for two covers and the two that saw print were faster and easier to produce. The character was a vaguely parodical amalgam of other, earlier comics characters (conceptually Nova , visuallly Nova and the Charlton-era Captain Atom) , so any resemblance is less than coincidental. We never had any idea which alien race was responsible for Tommy's powers. As for his being able to fly by lowering his atomic weight, though neither Sholly nor I are scientists in the strictest sense (though he IS a doctor), both of us were knowledgeable enough to know that it shouldn't work that way. This was intended to recall and poke fun at the "fake-scientific-explanation-of-the-hero's-powers-that-make-no-damn-sense" trope that had been an integral part of the comics landscape---e.g. Stan and Jack's insistence that the Human Torch could fly because fire is lighter than air. If being covered in fire made this possible, then the skies over Hollywood would be filled with gravity-defying stuntmen. Which would, on examination, be pretty cool. ...and it added up to a grand total of two letters. But that changed a month or two later, when Jim and I each picked up that week's issue of the Comics Buyer's Guide. At the time, CBG ran a sporadic column called "Squash That Rumor!" This particular column talked about how a specific issue of Avengers was rapidly disappearing from back-issues bins in Pittsburgh and starting to become rare as a result. Nobody could figure out why at first -- until they realized that it was the issue that I had designated as the MC Escher issue of Avengers. Apparently, people were spotting it in stores and saying, "Wow! Avengers #124 for only $2.50? That's worth $12!" (since I had written the price guide with the thought that an actual Escher issue should probably go for a bit more money). And so, they were snapping it up, the issue was becoming rare... and the demand was starting to drive the back-issue price up for real! So that's when we realized that people had read the article and didn't get the joke --despite the explicit disclaimer and the fact that the article included stuff like an entire year of Conan fighting animal gods named after characters from Winnie the Pooh. I felt a little bad about people spending money on the Avengers issue, but realistically, it was a cheap back issue and a good story (part of the Englehart Zodiac arc), so there wasn't a lot of harm done. I had created the pseudonym "Jack Fury", and the name can be found in a number of '80s Marvel projects (if I could remember them all, I'd list them for you, but I can barely recall what I had for lunch yesterday). Generally, Mr. Fury was myself, working in concert with at least one other creator who wished to remain anonymous. When Jim Shooter was less than happy with the first issue of Justice (New Universe title) and original penciler Isherwood was unavailable, Shooter enlisted the aid of a small army of artists to redraw large portions of the book over the space of a single weekend. Said army consisted of myself, Art Nichols, Mark Bright, Mike Harris, Frank Giacoia and Vince Colletta. When time came for credits to be applied, Shooter felt that a long list of art credits would make the book's slapdash nature even more obvious and suggested that a single collective name might work better. I offered up "Jack Fury" and the rest is some sort of history. It had been my hope to make the name available to anyone who wished to keep a low profile for whatever reason, a la Alan Smithee, but I don't think anyone ever took me up on it. Sholly and I wound up creating an entire history for the fictional Mr. Fury, going all the way back to the 1940s and his creation of the Blue Whiz for "All-Swell Comics". We crafted an article detailing the reclusive artist's body of work, but it never saw print. This sort of thing was actually pretty popular during the '80s (See "Amazing Heroes" magazine's non-existent contributor Sidney Mellon, or Dark Horse Comics' faux publishing history of "The American"). Determining which Earth was home base to Lectronn? Not moot at all! For the record, the original Lectronn was native to the regular-Marvel-Earth (616?). After only a few adventures, he officially retired from crimefighting moments after losing his virginity to longtime crush Amy Jo Bessolo. They live happpily in Pennsylvania, where Tommy is a high school English teacher, Amy Jo is a party clown (--excuse me; "full-service family entertainer") and oldest son Nathan was voted by his junior high class Most Likely To Be A Super-Powered Mutant. As for the Lectronn of Earth Mutant X, he has a different background and origin altogether. Underachieving,steroid-abusing jock Rider Richards was attending Empire State University on a football scholarship. One spring afternoon, Richards (cousin of this reality's Reed Richards) went to visit the office of ESU Psychology Department head Professor Martin Braine, hoping to strong-arm Braine into giving him a passing grade. Before the matter could be settled, a Cosmic Ray experiment being conducted elsewhere in the building by students hoping to apply for summer internships with A.I.M. went awry, fusing the two men into one super-powered being... and Lectronn was born! 'Cause, you know, everything on Earth-Mutant X is all grim and gritty and crap. Lectronn received an entry in the Civil War: Battle Damage Report#1. Profile by Monzo, Sholly Fisch and James Fry III.